My favorite upgrade in the Toaster is also one of the most easily overlooked: The foot pedal at our kitchen sink. We did the mod as a kind of offhand tweak, without realizing what a major impact it would make on our full-time boondocking lives. But it has turned out to be HUGE for us! I had seen them before in doctor's offices and other industrial settings: A set of pedals down by the floor, which operate a water valve for a sink. Presumably this is done for improved sanitation (no touching sink knobs with messy hands), but it seemed like a great way to have more control over water flow. The valves are a touch pricey, but considering that they are industrial-grade equipment and will probably outlast the Toaster by a few decades, the expense seemed justified. A number of pedal shapes and configurations are available, so you can choose the one that works for you. But in our case, the space to fit the pedal was very small, so we opted for a single, short model. We purchased ours through an industrial supply house along with a number of other fittings we needed for the rebuild, but there are quite a few choices available on Amazon these days. If you have the space, a two-pedal valve gives you separate control of hot and cold water, and makes the plumbing a bit simpler. A single-pedal foot valve similar to the one we used. Our choice to use a mini-tank POU water heater. It took a few iterations, but I eventually came up with an arrangement that works very well for us. Here's two simplified plumbing diagrams, showing only the connections relevant to the kitchen sink for clarity. They show both single-pedal and double-pedal options. The Toaster uses the single-pedal configuration. All water supplying the sink must pass through the foot valve first. There is only one supply line from the pump to the sink, and it's cold water. When we press on the foot pedal, it opens the valve and allows pressure from the water pump to enter all the plumbing lines downstream of the pedal. This means there is cold water available at the kitchen sink "cold" tap, and also cold water available to go into the hot water heater. 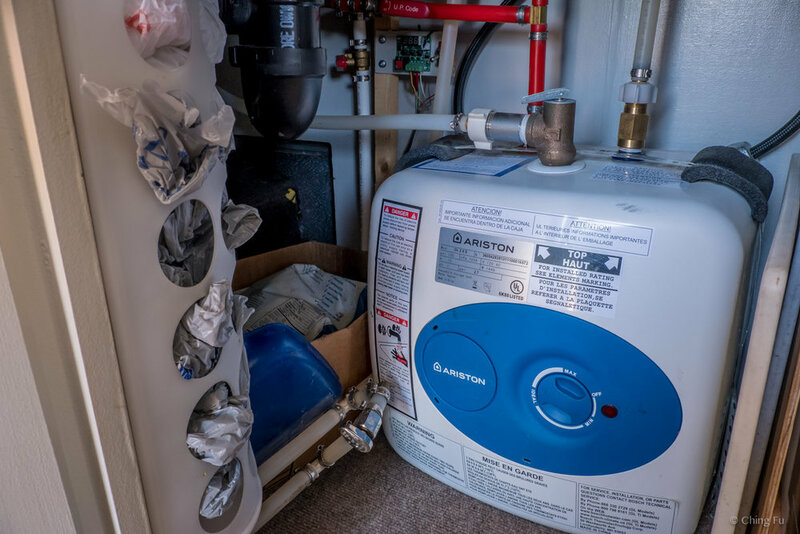 Assuming the water heater actually contains hot water, the pressure provided by the cold inlet pipe also provides the pressure to drive hot water out of the tank and up to the "hot" tap at the kitchen sink. The practical way this works is that when we want to use the sink, we first open the tap at the sink -- and nothing comes out. Then we step on the foot pedal and water flows. Our sink actually has a single lever, not two separate hot/cold knobs, but the principle is the same: If we want hot water, we turn the lever to the hot side and then when we step on the pedal, hot water comes out. The two-pedal plumbing requires more space and pipe, but the operation is a little more intuitive because there's a foot valve for both hot and cold. This would work best with a sink that has separate "hot" and "cold" knobs, because those two knobs can both be left open and then the foot pedals uses for each one, as desired. With a single-lever sink like ours, it would be a bit of a disaster. I haven't explained the check valve in the one-pedal configuration yet. My original system design omitted them, and I had to add them later. It turns out that the mini-tank water heater acts similarly to a pressure cushion, also known as an accumulator tank. We do have such a tank in the system, and it's great for reducing how often the water pump cycles on and off. The POU water heater is not designed to store pressure, but nonetheless it does store a little. Without the check valves, we found that the pressure from the water tank would drive some water through the faucet even when the foot pedal was not pressed. When you step on the pedal we want water to start flowing immediately, and then when we step off it, we want the water to cut off quickly. But with the extra "cushion" in the hot water tank transmitting pressure to both the cold and hot taps of the faucet, stepping on the pedal meant the water would come on gradually, and when we released the pedal it would slowly trickle off to a dribble. This wasn't horrible, but still used more water than we wanted. The fix is the check valve. It allows cold water to flow into the water heater to replace hot water which is consumed. But it doesn't allow the pressure in the water heater to drive cold water to the cold tap, and this eliminates the dribble entirely on the cold side. I also tried using an adjustable cracking-pressure check valve on the hot side, to let hot water out of the tank but only if there is a certain minimum amount of pressure pushing the hot water. This probably would have worked, but required repeatedly disassembling the plumbing to mechanically adjust the pressure setting of the valve. I ran out of patience before I got the pressure dialed in, so we're still living with a little dribble on the hot side. We chose a single foot pedal primarily due to cramped installation space, but we had one other reason we thought we wanted it - having a single foot pedal lets us use the faucet to "mix" hot and cold for water that's warm instead of maximum hot. In reality though, we have set the water heater to give us hot water at the max temp we want, and we never use the faucet to mix them. It's either hot or cold. If we could have fit two pedals, that would definitely have been ideal for us. The POU water heater was a major factor in our plumbing arrangements because it meant we only had a single cold supply line entering the kitchen area. In nearly any other RV, separate hot and cold water lines would be routed to the kitchen sink. In that case, a dual-pedal setup would be extremely easy and straightforward, but "mixing" the hot and cold could be tricky depending on the faucet fixture type. If you're thinking of installing a pedal, take the time to think through how your usage and plumbing fixtures will work together. Because this isn't a common arrangement, it's not so easy to find cookie-cutter plans for how to plumb it together, but it's definitely doable with off-the-shelf parts and a little patience. In short: wonderful. 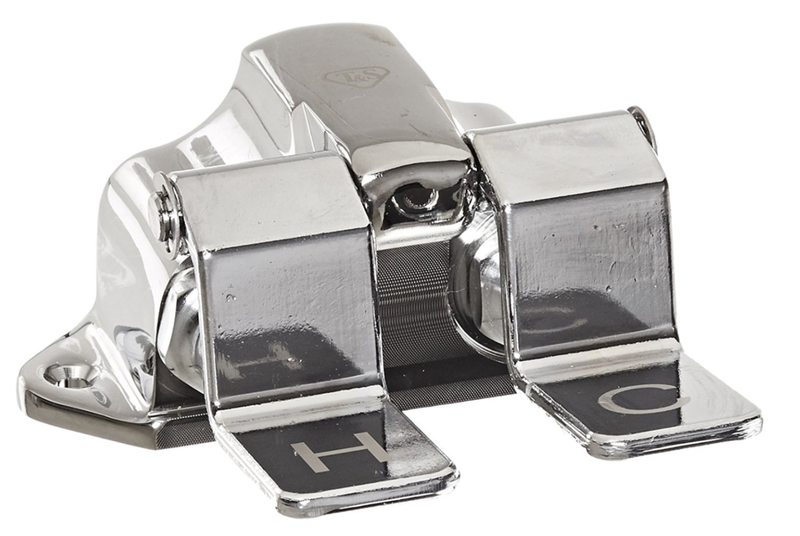 There is a short learning curve - a little longer for me because I'm a rightie and our pedal is on the left side - but after a very short while you'll wonder why these aren't in every house. After using it for a few months we developed a feel for making small adjustments in the pressure we apply to the pedal, much like learning to use the brake and accelerator pedals in a car. We regularly modulate water flow from a trickle to wide-open using only the pedal, using only exactly enough water to get the job done while washing dishes, or anything else. We don't have the equipment to accurately measure and compare actual water use with the pedal vs. without, but I'm confident that the kitchen foot pedal is the primary reason we routinely make our 40 gallons of freshwater last at least 7 days - without using disposable plates, cups, or cutlery, and cooking every meal at home.